Soil blocking is a sustainable way to start seedlings. 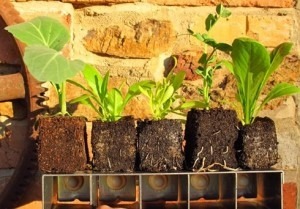 Efficient, easy, fun and great for growing strong healthy seedlings, soil blocks are used in large-scale horticulture in Europe and are gaining popularity elsewhere. Soil blocks are small self-contained blocks of lightly compressed soil that allows seedlings roots to be air pruned and allow plants to re-establish quickly following transplanting due to minimal root disturbance. While most Australian gardeners may not have heard about soil blocks, soil blocking has been a tried-and-tested method in Europe for decades and has been dated back to the Aztecs some 2000 years ago1. 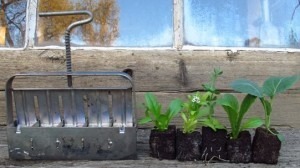 This pot-less method of raising seedlings is especially popular in the Netherlands, where it is used on a large-scale in commercial horticulture. Soil blocking is rapidly gaining popularity with home gardeners and organic market gardeners in the UK and USA. So, what’s all the fuss about? In a nutshell, soil blocking is a sustainable method for raising seedlings that is inexpensive, and best of all, results in strong and healthy seedlings! One of the major advantages of the soil block method is that it makes it easy to transplant seedlings without injuring the roots. This is particularly good for plants that do not like their delicate roots to be disturbed, such as pumpkins, zucchini, coriander and dill, to mention a few. 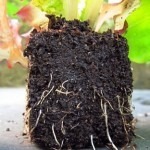 But all seedlings will benefit from minimal root disturbance. 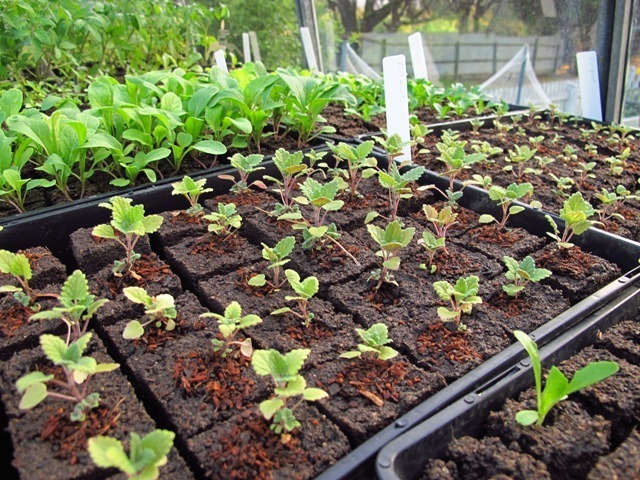 Many gardeners find soil block seedlings re-establish more quickly after transplanting and produce healthy plants. Another important feature of soil block seedlings is their healthy root system: seedling roots undergo natural air-pruning, resulting in a stronger root system that will not become pot bound. Before discovering soil blocking we experimented with several alternatives to grow our seedlings. We tried newspaper pots, loo rolls, salvaged plastic punnets and cell trays. Cleaning plastic pots was time-consuming; we weren’t keen on adding glue from loo rolls or newspaper inks into our organic veggie patch (soy and vegetable based inks are used in newsprint but inks may also contain other less environmentally friendly additives and pigments); and then there was the question of where to store all the plastic pots and loo rolls? Soil blocking solved many of these issues for us as it eliminates the need for pots and is entirely compatible with organic gardening. Making soil blocks can be as simple or fancy as you choose. 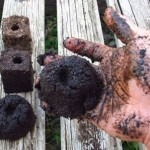 If you only need a few seedlings you can form soil blocks with your hands. A second low-cost option is to use salvaged materials and make your own soil blocking tool (See below). The third option, which we went for, is to purchase a soil blocking tool2. 1 part coir-peat (soaked overnight in cold water, or just add hot water). This helps retain moisture and nutrients. Like any recipe, you can experiment and optimise it to suit the ingredients available to you. Some recipes include perlite, vermiculite, coarse sand or soil to help with drainage or blood and bone as a source of nutrients. Set aside some of the dry mix (1/2 of your total if it is your first time). In a container with a flat bottom (e.g. old baking tray or large tub), add 1 part water to 2 parts dry mix and mix well. You are after a consistency of sticky mud or porridge. Add more water until the right consistency is obtained. This may differ each time according to the ingredients. Think playdough: make shapes that can stand on their own. Push a finger into the block to create a hole for the seeds. If you use a Ladbrooke Mini 4, you will need 5 litres of dry mix which will make 30 blocks (different models make different size blocks). Push the tool down into the mix until you see some water coming up the top of the tool (charge several times if necessary). We find that for efficiency, pile your mixture 7 to 8 cm high. Scrape off excess mix on the bottom of the blocker. Fill the hole in each block with one or two seeds. Cover the seeds with a thin layer (a few millimetres) of worm castings or compost. When roots appear on the sides of the blocks they will start to hold the soil block together and indicate that the seedlings are almost ready for transplanting. Start everything in these. Great for bigger seeds and plants. Growing tomatoes, chillies and other seedlings to larger size. If small seedlings are required for transplanting, use Mini 5. E.g. if in kitchen window sill, heating pads, seed starting/germination boxes. Using seeds with unknown or low germination rate. “Pot up” into the Mini 4 (2”) blocks. Save space in greenhouse for larger garden. Richard Lee is an ecological urban farmer in training specialising in Soil Block Seedlings, herbs and baby salads. Trained as an evolutionary biologist, he now runs KABUU.com.au, a start-up urban agriculture enterprise based in Melbourne with the goal to transform currently vacant and under-utilised urban spaces into thriving food producing systems supplying quality fresh food to local communities.